Our engraving is a side sectional elevation of this improved pump, the advantages of which will be apparent to the reader as we proceed in our description. The pump is one of that kind which have a rocking or oscillating piston, the water being discharged through the central shaft. A is a cylindrical shell, through the center of which a hollow shaft, B, passes, this shaft hieing fitted so as to oscillate. C is a hollow piston attached to, and forming part of the shaft, B. The extremity of the piston, C, nearly touches the inner periphery of the shell, and when the shaft, B, is oscillated, the piston sweeps the shell from x to x\ D is a permanent valve seat, upon which the flat valves, E E', rest (a being the openings of the valves). F is the induction port, communicating with the openings, a a\ 5 is a leather hinge or flap, to which E E are attached, the middle of h entering a cavity in the center of D, where it is secured by a wedge-shaped block of wood, G, an additional packing or strap of leather, c, being interposed between the wedge and the flap, 5. The under side of the shaft, B, touches the top of the wedge piece, G, which thus forms a packing for the oscillating shaft, B. The wedge piece, G, is of the same length as the width of the interior of the shell, A. The wedge piece thus performs the double function of packing the oscillating shaft, and keeping the flaps, 6, with their valves, E E, in place. Several important advantages arise from this arrangement. Both the wedge, G, and leathers, h c, swell slightly when moistened. This swelling tends to press the wedge piece tightly up against the shaft, B, but the pressure is, to a certain extent, elastic, owing to the nature of the materials. The ends of the strip, c, are also projected up against shaft B, and act as a packing. H is a ,pendulous valve, suspended from the extremity of C, and extending down through the central part of it. The valve, H, swings alternately against the inner surfaces of piston B, and then alternately opens and closes the apertures, d d, the outer ends of the leather, H, serving as a packing for C against A, being kept in position by the screw bolt, m. When the piston is moved in the direction of the arrow, 1, the resistance of the water above the piston presses down the valve, H, so that it closes the aperture, d, leaving d open. The water above or in front of the piston also closes the valve, E, and it is, therefore, forced to make its exit through d% into B, as shown by arrow 2, whence it emerges by a nozzle attached to one side of A. The advance of piston C, in the direction of arrow I, produces a vacuum behind the piston, which opens valve E, and inducts the water through the passage, a\ When the motion of the piston is reversed the valve E, is closed, ' and d% while d is opened, and the water is passed into the shaft in the opposite direction to what it was before. The tripping of the 4| valves in order to permit all the water to ' escape when desired, is done in the following manner :—Upon each of the valves, E E, is a projection or pin, g and the back end of the valve is turned up a little, so as to form projections, i i. If the piston, C, be made to oscillate sufficiently far, its lower sides at the end of such movement will come in contact with one of the projections, i and the valve, E, will be tripped or lifted, and the projection, ffj will pass through d, and strike againsi H, lifting that also. A similar operation takes place at the opposite side, and no air is allowed to pass in, and thus spoil the vacuum of the pump. The shell. A, is notched at n to admit of the beat, D, and is mounted in a stand, I. This pump can be worked by hand for wells, &c., or by power, as it is peculiarly adapted to be worked by an oscillating engine, no gearing being necessary, and as a fire engine it would be valuable. They can be placed any distance from the surface in wells, and so are applicable in ships. 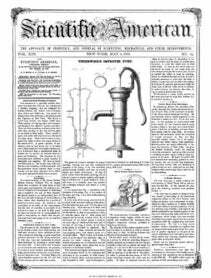 The inventor is Washburn Race, of Seneca Falls, N. Y. Any further information can be obtained by addressing Race & Matthews, of the same place. It was patented November 24, 1857.